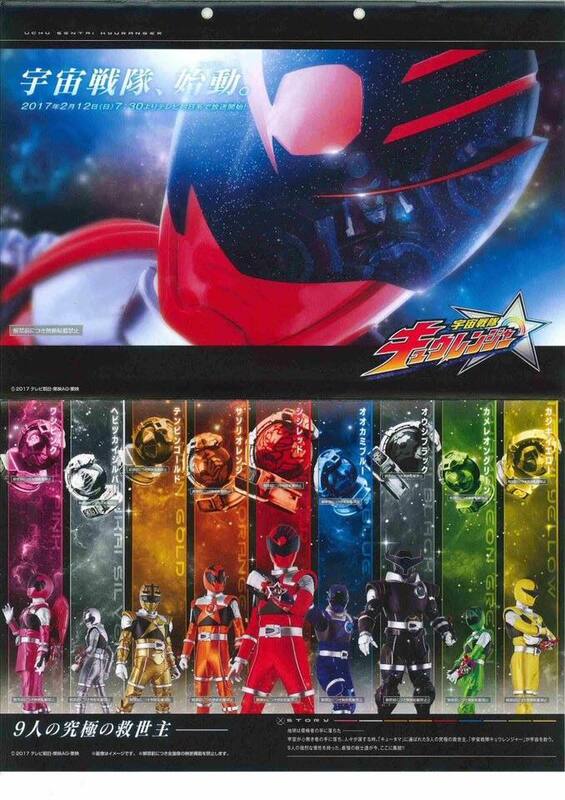 A new promotional image for 2017's upcoming Super Sentai Series (which will debut in Dobutsu Sentai Zyuohger VS Ninninger The Movie) has surfaced giving us a much detailed look on the ranger suits! Looking from it, the suits has this futuristic feel in it (sorry Timerangers, their suits really are far more futuristic) and as we can see,next year's Black Ranger suit actor is a hulking guy for a ranger! IMHO, their helmets are very well designed which suits the planetary/constellation theme very much. What are you expecting from this team before their series hits next year? Will this team reignite the ratings that is Zyuohger is lacking lately? Uchuu Sentai Kyuuranger will premiere in February 12, 2017 replacing Dobutsu Sentai Zyuohger after the series ends. I wonder with the way the mechs will be combining and how blue black geeen yellow seem to be always together and silver pink gold and orange appear together if this might end up being set up like two different set of teams with red leading both for different types of missions. Wooooow these designs really reminds me of Saint Seiya!^^ look forward to seeing them when they come out. IMHO, this really should've been the 40th Sentai. 1. They have Every Ranger Colour (Except Violet and White) on their Team. 2. The Deathgalians (Space Invaders) would still be the Villians because the destroyed many planets durings their games so having it connected to the Rangers in having the motive of avenging their worlds would've made more sense than the Zyuman who have never encountered the Deathgalians before. As they build their team they track the Deathgalians to Earth where they meet the Red Ranger and offer their help in protect his planet. 3. It's Space themed, so the encounter with the Gokaigers would've made more sense or at least made it interesting with a Space War with the remains of Zangyack with Bangray leading it. Being Space Pirates the Gokaiger thinks the the Team is part of the Space Police and attacks thems. But then the Red Ranger remembers who they were because he was there when the Rangers saved Earth 5 years ago (Lost Galaxy Reference). 4. Since this is the 40th sentai and it space themed, a Crossover with Fourze (40th Anniversary Rider) would've been great where Bangray read Gentaros memories and recreates the 12 Horoscopes. 5. Just like the Zyuman, the Red ranger will be teaching them about the inhabitants of Earth but while encountering many Legendary Heroes (Sentai or Rider) they all also learn about the history of the the many Heroes who fought to protect this planet before them. They look good but two nitpicks. Black is too bulky and looks out of place and most of the visors just look weird. (And golds reminds me of gold mega mode from Samurai). Wow! Is this the first series to feature officially a female green ranger? is this going to be like Armored Fleet DaiRugger XV? I can't wait! Some may think it too much, but I'm hoping for a violet, white, and maybe even gray and/or cyan, just so we can truly have every color ever in one team. I think we actually have more (explicitly) orange heroes than violet, now that we have Zyuoh Bird and SasoriOrange. It almost looks like OushiBlack is the "sixth" or "extra" because of how different his suit is. Well....i must admit that at first the series didn´t like me....but after thinking better ....i think ill see this series . And i agree with the coment about de suits , sorry timeranger and dekaranger . Anybody else notice that pink has wings? Or am I just seeing things? Yo...that is sooo trueee!!! How did Toei not think of that? Maybe they did, but obviously a bit too late lol. Anyways, I also see this as the 40th super sentai rather than the 41st, but eh. hmmm I do not like the black ranger, for me the perfect team would be: red, blue, green, yellow and pink. I do not like the black ranger, for me the perfect team would be: red, blue, green, yellow and pink. With the last few years being so unimaginative, I am loving this new design. I just hope the new mech and story execution will be as good. They're making more orange rangers! Currently there are 5 orange rangers (Battle Fever J, Kakuranger, ToQger, Zyuohger, and this season). There's a new orange ranger! This means there are currently 5 orange rangers (Battle Fever J, Kakuranger, ToQger, Zyuohger, and this season). Even though I've never really liked Super Sentai, even of how it is now, I can feel a good vibe from this and hopefully it will change things for good. A good storyline and none of this forced comedic goofy crap we've been seeing in recent years. But I'm not holding by breath just yet. We'll just have to wait for more info nearer the time. Is anyone notice that the mech is reflected in red's visor? the mech look so good for me by the way. There was no orange in Kakuranger. Kakuranger was NinjaRed, NinjaWhite, NinjaBlue, NinjaYellow, NinjaBlack, and Ninjaman, who was dark blue. Bigger cast enables more character interactions, as proven by Kyoryuger, and I'm already digging that. But these assymetrical designs? I'm sold! They look great, and shows a lot of personalities! Female Green who don't start out as villain? Pink's wings? Black's massive body? Others might not like those, but they already scream 'different' for me. And we need one, especially in a long running series like Sentai. Beside, Blue also have bigger body than the rest. I wonder why nobody complaint about that. Lol. The point is, this already feel fresh-er than common Sentai, and I do feel we need to at least appreciate Toei's guts to go with it. Btw, I wonder if we might get additional 3 members, so that the number becomes 12 like the zodiacs. Unlikely (since the name means 9), but one can fantasize, right? Wait, Kakuranger got orange Ranger? I didn't know that. For those of you who have seen Batman V Superman, doesn't OushiBlack kinda remind you of Batman's armor suit? The suits look cool and I like the concept. With 9 members, I was expecting more girls in the team. Hope Yellow is, at least, transgender. Am I the only one that noticed that Gold and Black have the same costume type with the armor add ons that are separate from the other 7 (Pink's wings notwithstanding)?